It is probably the largest case of religious persecution which has taken place on the Chinese mainland since 1949. Mr. Wu Ze Heng, alias Xin Yu, is the 88th Patriarch of Buddhist Orthodox Dharma and the founder of Hua Zang Intuitive Heart Dharma. His Buddhist honorific title is His Holiness the Vairocana Xing Wu. 12841 was his prisoner-number during his imprisonment. Mr.Wu Ze Heng was guided by eminent monks at very young age, and studied Buddhism as a recluse on a mountain. In 1990, He left the mountain under orders from his masters and began to disseminate Buddhism widely in the secular world helping to benefit the world and all its inhabitants. During His 10-year stay in the secular world, thousands of believers followed Mr. Wu Ze Heng to practice Hua Zang Intuitive Heart Dharma. Meanwhile, Mr.Wu sensed deeply that the incompetency of the Chinese communist party rule had resulted in suffering for the common people. He then submitted a letter to the central government entitled Mr.Wu Ze Heng’s Suggestions to the CPC Central Committee and State Council in 1998. For these reasons, the Chinese government became suspicious of Mr.Wu Ze Heng and the Hua Zang Heart Intuitive Dharma. On July 31st, 1999, Mr. Wu Ze Heng was arrested for religious and political reasons, and then sentenced to 11 years imprisonment under the accusation of “economic crime”. 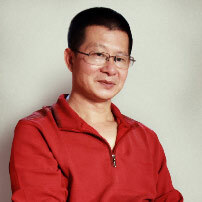 During his imprisonment, his accusation was changed to the crime of “Endangering National Security”, and Hua Zang Intuitive Heart Dharma was arbitrarily defined as “an Illegal Organization Endangering Society”. Meanwhile, Mr.Wu had been suffering inhuman tortures and ravages, which pushed him to the edge of spiritual and physical collapse several times. The practitioners of Hua Zang Intuitive Heart Dharma suffered a thorough purge. They were pursued, captured , arrested, and imprisoned. They were monitored nationwide and their homes were ransacked. On February 28th, 2010, Mr. Wu was released from prison. However, so far, he is still under surveillance at home in Zhuhai, Guangdong Province, and his movement is severely restricted. Countless times, the local police, under the name of “unlawful assembly” have harassed Mr.Wu through restriction, raids, threats, fear, surveillance and interrogation. Even on the Buddha’s Birthday, more than 20 policemen rushed into Mr.Wu’s house, used violence and force to take him into custody in a police station. For more than 4 years, the local Public Security Bureau refused to issue the travel documents (passport and Pass for Hong Kong and Macao) for which Mr.Wu had applied. Though being deprived of all religious activities, Mr.Wu still upholds the Mahayana principle of Buddhism, persisting in bringing relief to people. After release from prison, facing frequent natural disasters on earth, he initiated the holy activities —“Fasting for Charity & Good Deed Every Day”— for human self-redemption to the global population through different networks. Unfortunately, the activities were continually obstructed in several areas of mainland China. In some places, they were proclaimed as “illegal charity” and volunteers suffered persecution and suppression. 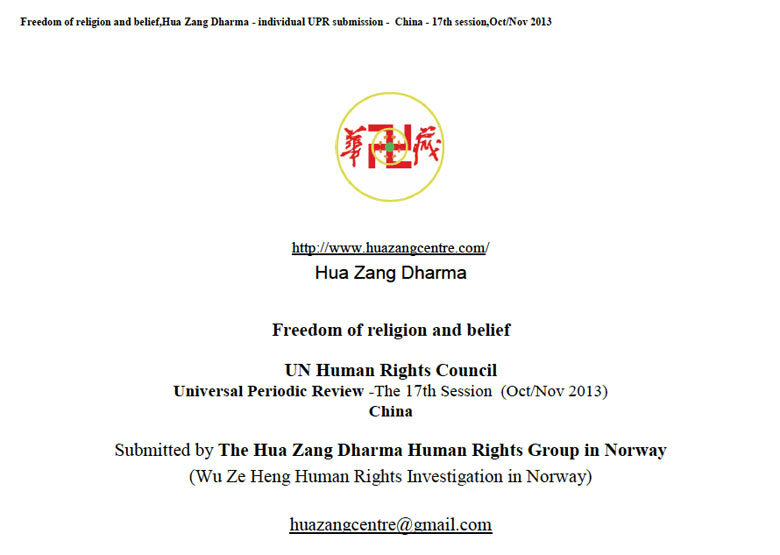 The CCP persecuted and tried to ban the Hua Zang Dharma, but Mr. Wu Ze Heng and His disciples still persist in their belief, using Civil Disobedience, striving for human rights and the freedom of religious belief. Mr.Wu tried every level of judicial procedure, but received no response. 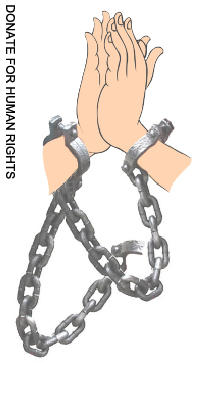 Currently, suppression and persecution are still continuing and being extended. Any persons or things connected with Mr. Wu are being stifled by “gangs”, from freezing the enterprises operated by his friends to stopping farming, and so on. They could disappear at any time, and their situation is still dangerous. Mr.Wu Ze Heng still leads his disciples in the struggle to protect human rights, to safeguard the dignity of law, and to create a civil society with justice for all. On 31st July 1999, Mr.Wu Ze Heng was arrested for “economic crime”, but actually they were religious and political reasons. As the 88th successor of Buddha, he had preached Buddhist Dharma all over the country and abroad for ten years, and had tens of thousands of followers; In 1998,concerned about China´s social crisis, Mr.Wu submitted a letter to the Chinese Communist Party Central Committee and State Council for political, economical and social reform. This caused the Chinese Authority great concern. The Process Of Establishing the Hua Zang Enterprise Co., Ltd.
On 20th December 2000, The Beijing First Intermediate People´s Court of the first instance held a closed hearing, sentencing Mr.Wu to 11 years jail for “Illegally operating a business” and “unauthorized issuing of shares”. 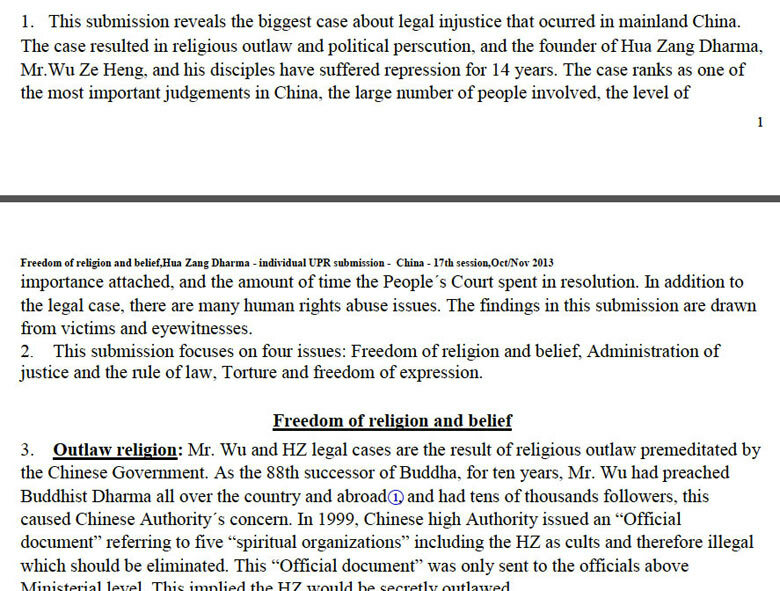 Hui-ji Prison arbitrarily transformed Mr.Wu´s economic crimes into “Endangering national security”, Hua Zang Dharma was an “Illegal organization that endangers society”. Jida local police station, and then taken to the Beijing Detention Center (Ban-bu-qiao). From July 1999 to 27th November 2001,he was detained in the Ban-bu-qiao Detention Center of Beijing. On 27th November 2001,Mr.Wu was taken from Beijing to the Lian-ping Prison in Guangdong Province. On 17th May 2002,Mr.Wu was transferred from Lian-ping Prison to Huai-ji Prison in Guangdong Province, and locked up in solitary confinemment. On 25th May 2002,Mr.Wu was transferred to the “Fourth District” in Huai-ji Prison,put on “A-level” torture. After 2005, he was transferred to the “Seventh District” in Huai-ji Prison.